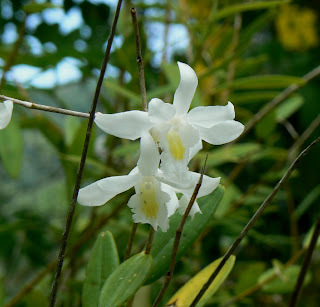 Daintree Valley Haven: The orchids were right! A lovely peaceful Christmas Day yesterday - and a call from our friend Di in nearby Daintree Village to say that their Dove Orchids were in full bloom, and when we looked out the front window we saw ours were too. The only time these beautiful fragrant tiny orchids seem to flower is just before rain and, sure enough after a very dry couple of weeks, last night we had a good fall of rain. A fine day again today and now (it's 5.30 pm) it's just started again and, looking at the weather radar on the internet there's plenty around so hopefully we'll get some more tonight - thanks Orchids!